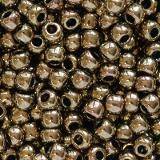 TOHO® beads round - seedbeads. Toho beads round is the most popular shaper of japan seedbeads. It can have many sizes as 11/0, 15/0, 3/0, 6/0, 8/0 and many colours and coatings. In our bead shop we sale seed beads, please check our offer now. Toho beads have got perfect shape, each bead is similar to each other. We sale our products in small bags 5 grams and in wholesale bags around 25 grams. This products are great for beading. 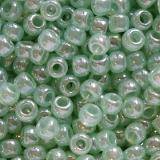 Toho round beads, small glass beads, beads from Japan. Retail and wholesale. Toho beads are popular small beads made of glass. 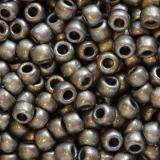 You will find among them the most popular size of Toho beads 11/0 or Toho 8/0 beads. If you do not know how to create and use them, we invite you to our jewelry course. You will learn how to make a bracelet on naim. 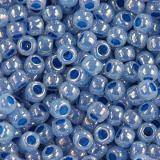 In our store you buy Toho beads at the cheapest price, we offer them in retail and wholesale packs. Learn more about these beads, especially Toho 11/0. TOHO round beads certainly occupy an honorary place in the collection of every beaded enthusiast and hand made jewelery! It's popular small beads made of glass. A Japanese discovery that is second to none. Unique in every respect, appreciated by jewelry and clothing designers around the world. What is the secret of TOHO beads? Anyone who has had the opportunity to work with TOHO beads knows how precisely they were made. It is round and regular shapes, as well as large openings that facilitate threading are their primary asset. Each bead is almost identical! Thanks to the equal shapes your jewelry will be a real masterpiece! Made of the highest quality materials and light as a feather. All this makes them so willingly used in the production of hand made jewelry. They will be perfect for creating beaded embroidery and braids. Using them you will make beautiful bracelets, pendants and earrings. Thanks to them you will also change your wardrobe! They are a fantastic element of decorating clothing. Sewing and threading with TOHO beads is pure pleasure. Get away from everyday life, forget about all the problems and indulge yourself completely in your passion! 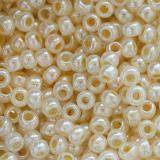 In our offer you will find TOHO round beads in all colors of the rainbow. A wide range of colors is not everything! Our beads are also distinguished by breathtaking visual effects. Let yourself be charmed by the shimmering million reflections with TOHO round beads with a glow effect. 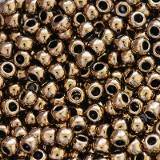 Let them seduce you with silver and gold beads TOHO made of silver lined and gold lined. Your heart will also be stolen by a frosty transpired Frostem collection with a characteristic "frost" effect. You do not know how to use them? Do you miss ideas? Look for inspiration in one of our DIY courses using TOHO round beads, learn how to make a bracelet. You will purchase beads in packs of 5g and wholesale 50g in four sizes: 11/0 and 8/0, 6/0, 15/0. It's best to take a few packages to spare! Be warned! Beading pulls in like a drug, and our beads disappear in the blink of an eye! First come first served!